Glenn Tamplin is set for a return to the dugout as Worthing Football Club welcome Bostik League Premier Division leaders Billericay to Woodside Road on Saturday. Billericay owner Tamplin sacked himself as manager after his team were dumped out of the FA Trophy at the hands of Wealdstone on Saturday but is now back as boss - just three days later. In a remarkable turn of events, Tamplin was announced caretaker manager on Sunday and has now been reappointed boss of title-chasing Billericay. Worthing - on the back of a defeat at Harrow Borough - saw their game at Kingstonian postponed last night. 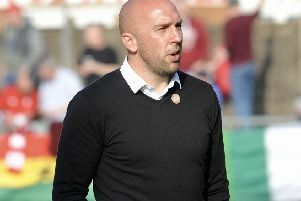 Boss Adam Hinshelwood is not concerned about anything other than Worthing's preparations going in to the clash with leaders Billericay and said: "All I'm worried about is preparing my team in the right way for what will be a tough game. We actually played quite well but were beaten 4-0 by them in the game at their place. "They've got a squad full of talented, experienced players but we caused them problems in the reverse game, we've got nothing to fear."